Several items are on the agenda for the May 7, 2014 school board meeting that may be of interest. (1) Increase current year budget for addition revenues received. On the Consent Agenda is an item asking the school board to increase the FY 2013 – 2014 school year budget. The increase is necessary because of revenues received in excess of the amounts budgeted. Citizens who follow this blog and members of the Gainesville / Brentsville District budget committee will find these items interesting as they happen every single year, yet PWCS continues to feign surprise that their projections are so low and refuses to update the revenue projections to come close to approximating reality. The projection for this school year and next are no different. Take Student Parking Fees, as an example. The chart to the right shows how much has been budgeted for Student Parking Fees since 2010, how much was actually received, and the difference between the two. 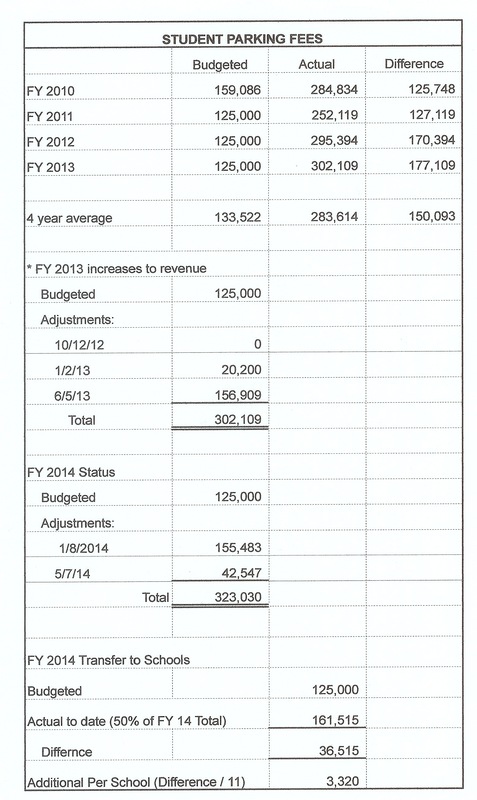 It also shows how much was budgeted for this year and the adjustments to date. Despite budgeting more than $150,000 less than what has actually been received for the past 4 years, PWCS budgeted Student Parking Fee revenue at the same $125,000 for next school year. Student Parking Fees is particularly interested as it is subject to a 50/50 split between central administration and the schools. For every dollar received for student parking fees, 50 cents goes to central administration to pay for lot maintenance. The rest goes to the high school use as they please. The transfer to the schools for Student Parking Fees has been budgeted at $125,000 for the past bunch of years, the exact same amount they budget for revenue. That means PWCS has been projecting that it will provide 100% of Student Parking Fee revenue to the schools, or it has been underreporting Student Parking Fee revenue. The difference between what was budgeted and actually received means each high school should have received $3,320 more from the county this year from student parking fees to do as they please. Concerned citizens and parents may want to contact the advisory councils at their local schools to ensure that these funds were received. (2) Proposed Boundary Change for 12th high school. No changes have been made to the proposal that was posted on the PWCS webs site a couple of weeks ago. Apparently citizen comments weren’t sufficient to merit a change (see link). (3) Mrs Williams (Woodbridge) has requested that the County School Board rescind the resolution they previously passed asking the Governor and General Assembly to decouple Medicaid expansion from budget negotiations. What’s $30 Million Among Friends? At last night’s BOCS meeting, Supervisor Pete Candland mentioned some savings PWCS had carried forward. The savings he noted ranged from $8 million in the 2010 school year to nearly $31 million in the 2014 school year. Supervisor Candland said he wouldn’t stake his life on the numbers, but that’s what it looked like to him. In January of 2010 PWCS reported “savings” of $8,249,361 in their 2nd quarter budget update. $8 million of that was carried forward to the 2011 school year. This January PWCS reported “savings” of $30,826,526 in their 2nd quarter budget update. $27.8 million of that was carried forward to the Construction Fund for capital improvements and $1.1 million was carried forward to pay for technology improvements. These savings aren’t the entirety of what is carried forward by PWCS each year. These savings are just the school division’s projections in January of what things will look like at the end of the school year in June. The actual savings that are carried forward at the end of the year are usually greater. What is carry forward? By statute, because they’re funded by taxes received from citizens, school divisions are not allowed to have any money left over at the end of the year. That means that any money that is left over at the end of the year has to be allocated, or carried forward, to the next year or subsequent years. It means that throughout the year the school division assesses spending, calculates what will likely be left over at the end of the year, and carries any excess forward to other funds or the next school year. Some of the expense categories that resulted in “savings” have been adjusted, so, presumably the savings that are carried forward in the next few years won’t be as much as they were this year. However, when you have from $8 million to $30 million in savings that you can carry forward to subsequent years, and that money primarily comes from 4 places – under budgeted revenues, over budgeted reserve expenses, over budgeted utilities expenses, and over budgeted compensation expenses – it is difficult to accept that there isn’t enough money to reduce class sizes beyond the 1 student in math in 6th grade that is contained in the FY 2015 budget. Don’t take my word for it, look and see for yourself. 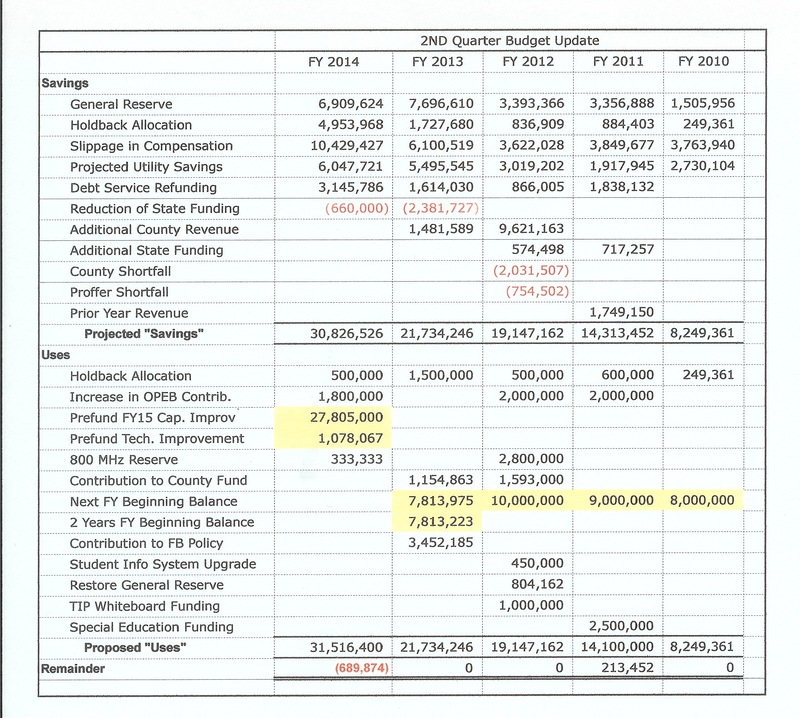 This file contains the 2nd quarter budget updates from 2010 ===>Q2Updates-2. These are the actual updates from the PWCS web site. The chart below is all of those updates conveniently typed into one chart. The cells highlighted in yellow are the amounts being carried forward. The columns are in reverse chronological order, so they start with 2014 and go back to 2010. When you’re living the dream! I just saw the Lego movie with my children, and that song was an integral part of the movie. As a Mom with two children, I spend a lot of time at movies like this and, as so often happens in these types of movies, my mind wanders a bit. See, if you listen to the reports about Prince William County, everything here is Awesome. We have the lowest taxes in the area and are one of the wealthiest counties in the nation! Everything is Awesome and PWC, we are Living the Dream! Except where we aren’t. Our taxes may be among the lowest in the region, but our tax rate is among the highest. Our household income may be among the highest in the nation, but it’s one of the lowest in the region. The agenda for the Feb.5, 2014 School Board meeting is available, and it will be a long one. Because the last meeting was cancelled due to poor weather, the meeting will cover all of the topics from the January 22, 1014 agenda and all of the topics from the Feb 5, 2014 agenda. Double the fun!! School Board Report for November 19, 2013.